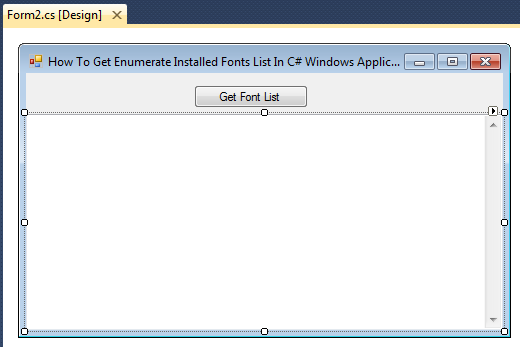 This article will show you how you can get the collection of all the fonts install in your machine using c# in windows application. Some of my previous articles are as follows: Display Message With Warning icon in Windows Application Using C#.Net, Display Message With Warning icon in Windows Application Using C#.Net, Validate Directory Exist or Not in C#.Net In Windows Application, Image Save In XML and Load XML Bitmap Image File in Windows Application Using C#.Net, How to Save Record in XML File and Read XML to Display in DataGridview Using C#.net in Windows Application, How to Add HyperLink and Retrieve Row Value on Link Click in DataGridView #, Windows application. In above code first I have retrieve all the font install in the textbox and after that I have prepare a string to display it in textbox.